He was completely deceived by the slower bouncer but the bowler didn't get the reward he deserved. The Bangladesh Premier League (BPL) might not be as popular as the Indian Premier League (IPL) or the Big Bash League (BBL), but for those who follow it closely, there has been lots of entertainment from the tournament. The tournament is now in the business end and the playoffs have determined the top three teams. Comilla Victorians and Rangpur Riders faced off in the last league game. During the match, Ziaur Rahman had luck shining on him pretty bright. In the 11th over the Victorians were struggling, pressure of the big game was showing on the batsmen as the team they lost half the team with just 39 runs on the board. Farhad Reza bowled a slow short ball, Ziaur tried to hit it but couldn’t catch up with the pace of the ball. 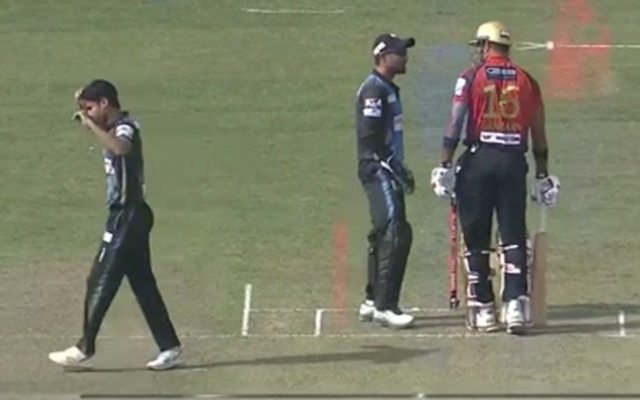 He missed it and the ball looped over his head and dropped down to roll onto the stumps. The bowler as well as the keeper had reached the stumps by then and were excited to see the ball hit the stumps. But to their utter dismay and Ziaur Rahman’s pleasure it did come in contact with the stumps, even made sure the LED lights lit up. However, the bails, placed pretty comfortably in the grooves didn’t pop out and as the rule has it, the bails have to be dislodged for a batsman to be given out. He survived batting on 6 then, the right-hander went on to score 21 from 25 balls as the team just crashed and were bowled out for 72 in 16.3 overs. The Rangpur Riders being as clinical as they had been chased the minimalistic target down without much ado. They got over the line with 9 wickets in hand and finished league stages at the top of the table also with a six-match winning streak.